At Universal, we have a dedicated team of graphic artists committed to ensuring that your design looks its best when it goes to print. Decorating your chosen product with your custom design would be impossible without well-prepared artwork to print your product with. Our team of graphic artists use professional tools to clean up, or in many cases carefully recreate, your design so that your design prints with crisp, clean details. When you place an order with us you can submit a design you already have, or found elsewhere, and our graphic artists will recreate your design in vector form, with any modifications you might want, so that when your shirts go to print, the details of your design will be clean and crisp. Don't have a design? No problem. 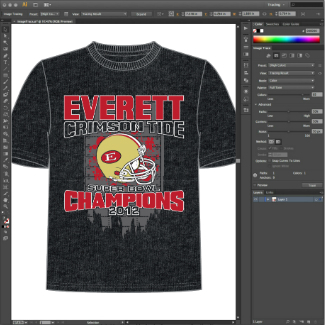 Our design team has created designs for events of all kinds over the years, from family reunions to charity drives, employee apparel to championship t-shirts. Our graphic designers can work from your description of what you have pictured in your mind, or even just what you want it to say, and create a design that you're sure to love.